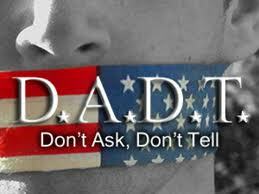 Recently the US Congress passed a law and the President signed it repealing Don’t Ask Don’t Tell. We are told that it is on fast track for implementation. This means that that another discrimination barrier has been broken and gay Americans will be able to serve our country in the US military as other Americans may do. There is very little reason that I should have to mention this in a psychiatry blog. After all homosexuality is not a mental disorder. Except perhaps for the fact that Don’t Ask Don’t Tell has caused a great deal of psychological pain to those who have had to hide their identify for fear of being kicked out of the military or suffering other repercussions. This should not be minimized, but overall it is a discrimination issue and one of social justice but not a significant psychiatric one. Obviously there were many psychiatrists and other mental health professionals who did not hold this view. There was an increasing amount of research which did not support it . 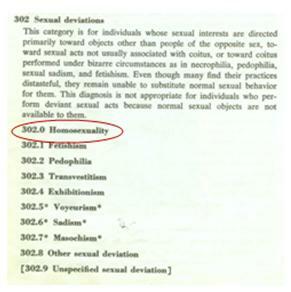 In fact, some experts believed that homosexuality was founded on genetic and biological determinants. There was also a great deal of clinical experience which supported the idea that sexual orientation could not be altered by therapy. There was an historic meeting of the American Psychiatric Association in 1973 where the APA Assembly debated and passed a position paper stating that homosexuality was not a disorder and an equally historic debate within the Board of Trustees which took this position. It then became the official position of the American Psychiatric Association which has been reflected in subsequent DSM publications. A few years ago I was broadcasting a podcast on the Internet and I interviewed Alfred M. Freedman who was the President of the American Psychiatric Association in 1973. I asked him about the background and the details of this famous debate. It was a very revealing interview in which he shared with me the behind the scenes activities involved with this event. A transcript of this interview was reproduced in theJournal of Gay & Lesbian Mental Health 13(1) 2009. Dr. Freedman was Chairman of the Department of Psychiatry of New York Medical College and hired me on the faculty there in 1980. He is now in his 90s living in Manhattan and still attends meetings of the APA. I am pleased to be able to provide the links to this video interview which can be seen on You Tube in three sections or heard on Shrinkpod in it’s entity.